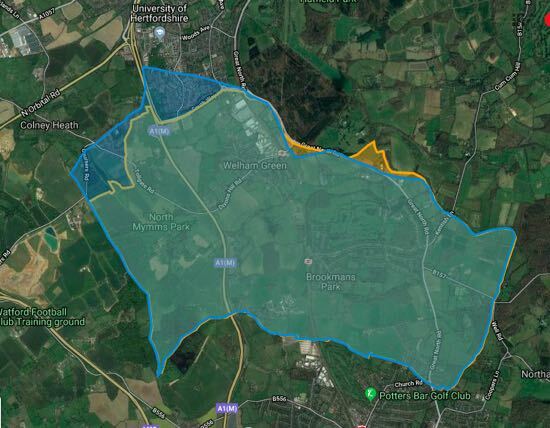 The North Mymms History Project has created an interactive map showing the outline of the parish of North Mymms as it was in 1914, and the outline in 2018. 100 years ago, North Mymms stretched as far as The Forum in Hatfield and included parts of south Hatfield and Roestock. On the Ordnance Survey 25-inch map published in 1914, the Rookery Cafe was outside North Mymms, today it's inside. Below is a map showing two layers. The blue outline represents the boundary of North Mymms when the 1914 was published, the yellow outline shows the boundary of the parish of North Mymms in 2018. To use the map, click on the square icon top right of the green bar below to view in full-screen mode. Then click on the red check box on the left to remove or add one of the maps. By doing so you will see the changes to North Mymms, in particular around Roestock and Bell Bar.